See the beautiful watercolor that Karen Vaughn Harding has created. She wanted both a pure white and a black version of her artwork. I created two separate files in Photoshop. First I removed the original background, placing the art on a separate layer. Then I changed the background , in the first example to pure white and saved that file as "White Poppy". 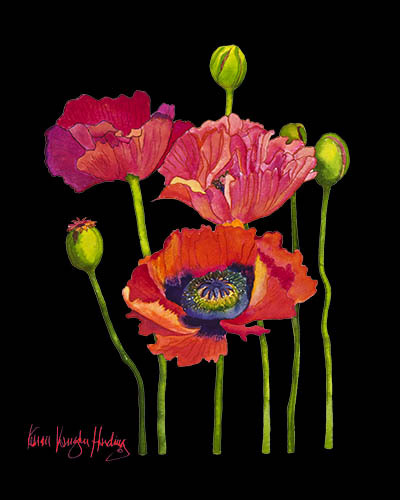 Next I changed the background to black and saved this file re-named "Black Poppy". 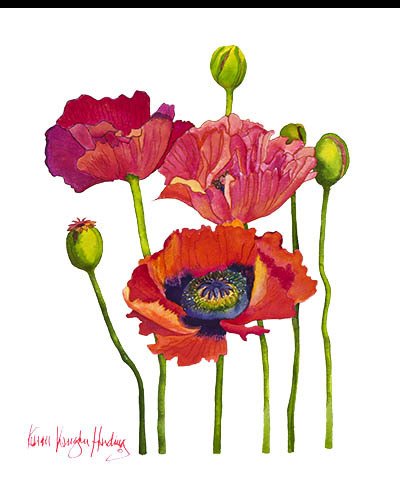 Now there are two versions of the same original Poppy flowers watercolor artwork. Buyers now can buy the Poppies on white , black or both . There is additional cost for computer graphics time when removing backgrounds and manipulating the image. Artists, you can have your original artwork digitized to be preserved forever. Take home a DVD and reprints to sell at artshows. Your artwork can be online for a small fee. I will create a digital file for you to print, or I can make a Giclee print using Fine Art Textured #310 lb. media or canvas . You may sign and number that Giclee print and sell to buyers who can't afford the original . My new Canon 8300 printer has 12 inks and can produce prints up to 44"wide & 10' long. Giclee technology differentiates from lithograph printing methods by the ability to accurately represent the largest spectrum of color possible in professional printing. By spraying ink directly onto the media, giclees are able to produce vibrant, accurate and uninterrupted color tones without separating the colors like a lithograph. This pigment based giclée technology will produce rich vibrant colors that endure over an estimated lifespan of 100-200 years in brightness and consistency.Giclee prints are slow and costly to produce. They are printed in short limited editions because of this. Due to their unmatched quality and rarity in relation to lithographic prints, Giclee prints have become highly sought after in the world of Fine Art collection.